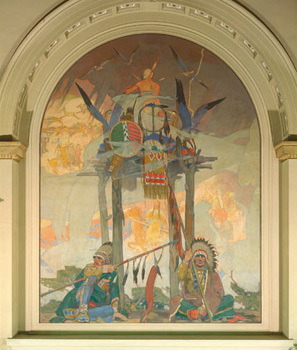 Indian Memories, a series of sixteen oil on canvas murals, were completed for the Colorado National Bank, 17th and Champa, Denver, Colorado, in 1925. At press time, the building is empty and in foreclosure. Happy Hunting Ground: At the end of the lobby is an arched panel depicting a departed chief with his shield, saddle, and other gorgeous trappings surrounding him on his burial platform. Two Indian men sit below as a rain cloud lifts and the storm passes. As other spirits pass by in the light, two blue herons and the spirit of the chief rise toward the Happy Hunting Ground. Photo by Marcia Ward. 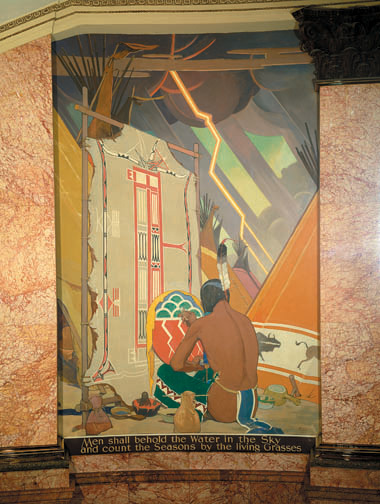 True worked on the eight History of Water in the West murals between 1934 and 1940, when the canvas panels were installed in the first floor rotunda of the Colorado State Capitol in Denver, Colorado. True wrote these early descriptions under his sketches. The words below each finished mural are by the poet Thomas Hornsby Ferril. Hydro-Electric Plants-Harnessing Water Power is sixth mural in series. Photo by Marcia Ward. 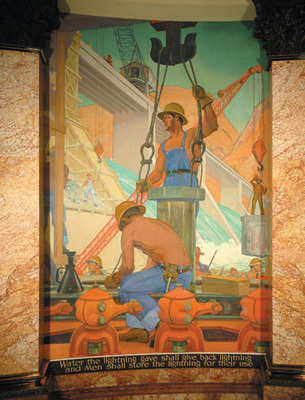 True worked on the eight History of Water in the West murals between 1934 and 1940, when the canvas panels were installed in the first floor rotunda of the Colorado State Capitol in Denver, Colorado. True wrote these early descriptions under his sketches. The words below each finished mural are by the poet Thomas Hornsby Ferril. Rain-The Source and Symbol is the first mural in the series. Photo by Marcia Ward. In 1931, True painted three murals for the Children’s Hospital Nurses Library in Denver, Colorado. The library is situated in Tammen Hall, originally the dorm and training site for the hospital’s nurses. Unfortunately, the murals have been removed and their whereabouts unknown. Indian Women at Rest is in an inset between book shelves. Photo by Marcia Ward. In 1931, True painted three murals for the Children’s Hospital Nurses Library in Denver, Colorado. The library is situated in Tammen Hall, originally the dorm and training site for the hospital’s nurses. Unfortunately, the murals have been removed and their whereabouts unknown. Indian Woman with Deer is in an inset between book shelves. Photo by Marcia Ward. 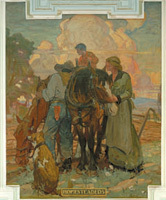 True was awarded a contract on August 27, 1917, to paint eight oil on canvas murals for the Wyoming State Capitol in Cheyenne, Wyoming.The four murals in the House Chambers in the east wing of the Wyoming State Capitol were finished in 1918, including Homesteaders. Photo by Marcia Ward. 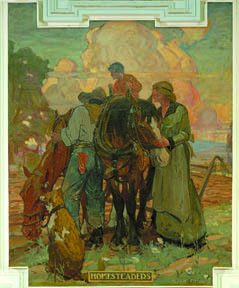 True was awarded a contract on August 27, 1917, to paint eight oil on canvas murals for the Wyoming State Capitol in Cheyenne, Wyoming. The four murals in the Senate Chambers in the west wing of the Wyoming State Capitol were painted in 1917, including Pony Express Rider. Photo by Marcia Ward. True painted eleven murals for the Mountain States Telephone and Telegraph Company Building in Denver, Colorado, between 1927 and 1929. The Wings of Thought–A Symbol of Modern Communication is in the inner lobby of the 14th Street entrance. Photo by Marcia Ward. True painted eleven murals for the Mountain States Telephone and Telegraph Company Building in Denver, Colorado, between 1927 and 1929. The Lineman–A Character Study is in the outer lobby of the 14th Street entrance. Photo by Marcia Ward. The Water Hole was commissioned by Jonas Brothers Furriers of Denver, Colorado, and completed by True in 1933. He was paid in furs, including an ermine coat, for his work. This mural is currently hanging in the City Hall Event Center, 1144 Broadway in downtown Denver. It is faded in places and suffered tears while in storage. Photo by Marcia Ward. 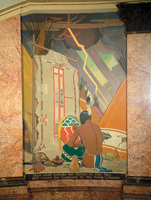 Indian Memories, a series of sixteen oil on canvas murals, were completed for the Colorado National Bank, 17th and Champa, Denver, Colorado, in 1925. At press time, the building is empty and in foreclosure. Youth; In the first in the series of triptychs, young boys are gathered around a crane brought in as a hunting trophy from a hunt. On the left, two boys emerge from the water to join the celebration. To the right, a boy is unloading more birds from a canoe. In the middle foreground is the Sioux sun symbol. Photo by Marcia Ward. 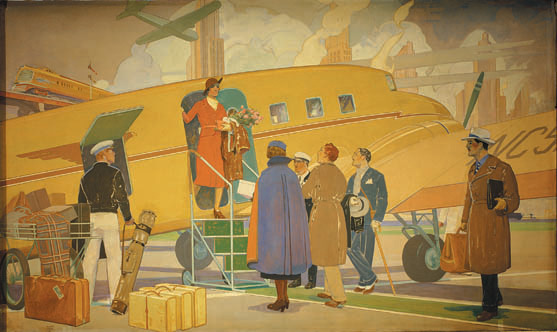 Two transportation murals in the Brown Palace Hotel in Denver, Colorado, were commissioned by Charles Boettcher, a wealthy Denver financier. True completed them in 1937. True’s Airplane Travel mural is located on the wall opposite the elevators in the lobby. Photo by Marcia Ward. In 1922, True created his Mother Goose series for the Colorado Springs Day Nursery school at the behest of Alice Bemis Taylor, patron and daughter of the school’s co-founder Alice Cogswell Taylor. They completely surround the upper walls of the auditorium, now used as classroom for 3 and 4 year old children. Photo courtesy of the Colorado Springs Child Nursery Centers.